Erica Fromme’s bold and luminous visual world is a fully integrative one that skillfully employs various techniques and processes that recall, on one hand, the world of biological processes, that is, specifically nature and its patterning. On the other hand the organizational impulses in her work are reflective of the artist’s combining of a world of platonic order (that is the rational, the Apollonian) conjoined with a rhapsodic, near-Dionysian universe of frenzied cacophony. Let’s examine the subject matter in Fromme’s artistic project. It is, firstly, various and many-layered. Indeed, the artists’s intentionality in her work is clear enough: she wants her abstract imagery to express visual form of things inherently non-visual, such as sensations or emotions and feelings. 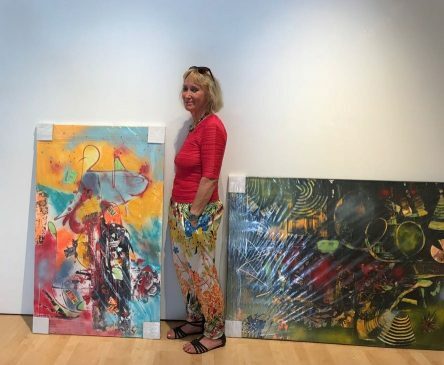 It would be accurate to categorize Fromme’s work as a synesthetic project devoted to the revealing of the process of abstraction, while strains of many tonalities course through it. Erica Fromme’s vision allows different worlds to co-exist. What float through her vision is a sea of associations and a dynamic network of connections as well as incongruent relationships of scale, color, textures and forms. In this way the artist allows an exhilarated transgression to take hold of the work characterized by an evident mental freedom that courses through each work. The hallmark of this freedom is the spontaneity felt through the artist’s elaborate building of areas of color, which are then layered so as to create visual passages of dynamic and spatial tension. The energetic surges in her work is made manifest through the oppositional visual tugs between rigid geometry and loosely applied form of lyric expressionism seen through her swirling colors. This atmospheric overlay of skeins of paint seems to have been painted as a response to outside stimuli, perhaps registering the artist’s emotions about an organic form. The artist’s point of departure was the burst of energy which becomes an unfurling linear formations that connote a dynamic internal world suggestive of an internal biologic world churning and in constant motion. 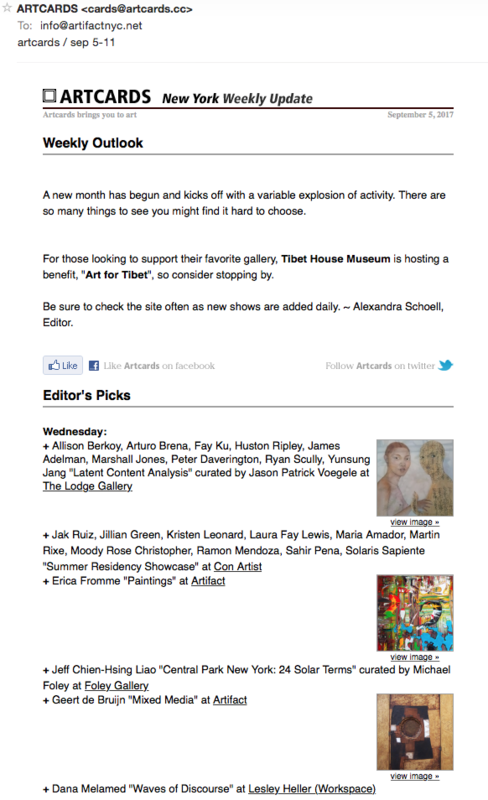 The result for the viewer is a change on how such non-traditional art is to be experienced. While seemingly activated by a rigorous underlying design principles that map out the surface structure of her works in coherent sections laid out in somewhat irregular grids, the artist’s process involves a decentering, a rejection of absolute value judgements. It also involves an acceptance of paradox, a recognition of relativism, a trust in randomness as a well as a trusting in chance procedures and a notion of cyclical processes rather than linear ones. 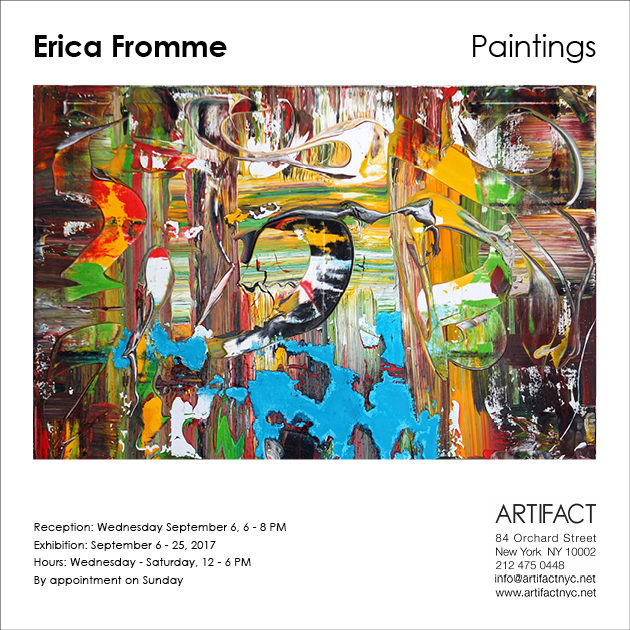 Erica Fromme’s paintings are complex ones, which put a premium on expressing emotion by distorting colors, shapes, and surface, in a highly personalized fashion. These sensations are realized through an embodied and lyrically suggestive abstraction that encourages us to recapture the world through the fresh responses of an artist who is ultimately unconstrained by tradition or convention. Wedded to this fresh perspective is the artist’s equally persuasive emphasis on capturing fleeting perceptions of time and space.